Refreshing flavors that can be enjoyed in the sun or in the cellar. 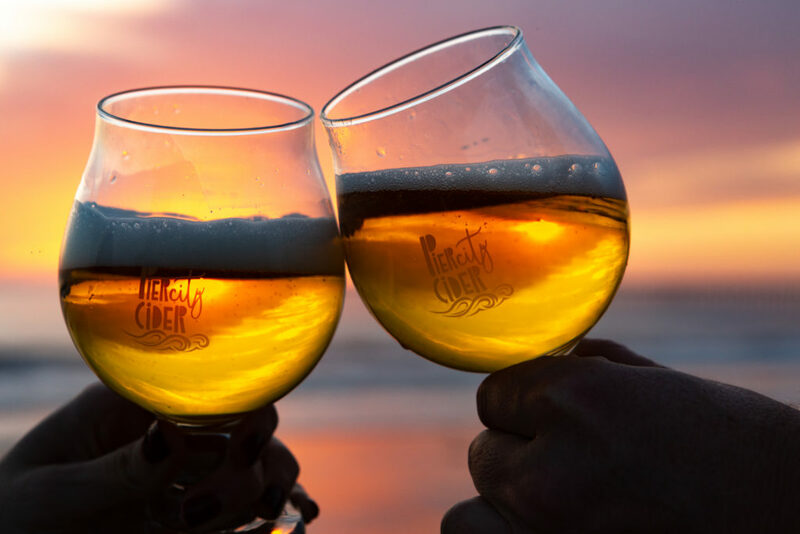 Pier City Cider is set to open Summer Solstice 2019 – More to come! If you want to stay in touch sign up to our mailing list below. Ask any winemaker and they’ll tell you, “It takes a case of beer to make a barrel of wine.” This was no different for winemaker Gary Stewart and his wife Karen at Four Brix Winery. But when Gary’s wife became gluten intolerant, beer was off the menu. The Stewarts turned to gluten-free hard ciders to get their refreshing fix during the Four Brix wine making process. While this solved the gluten issue, they still couldn’t find a hard cider to recommend to any of their friends. Many hard ciders were too sweet and others too sour. So what does a master winemaker do when he can’t find a hard cider he likes? He creates Pier City Ciders to bring a refreshing drink that can be enjoyed in the sun or in the cellar. Pier City Ciders are are unfiltered, sulfite-free, made with all natural flavorings, and of course gluten-free. Whether you are making wine, laying out on the beach, or just want a refreshing cider that won’t overwhelm your palate, crack open a Pier City Cider and enjoy. We are very excited to announce our very own take on hard cider flavors that we think you will enjoy! Unlike anything we’ve seen on the market, we hope that you are surprised and impressed with our brand new crisp and refreshing Pier City Ciders. Sign up for the newsletter to stay in the know on upcoming dates, events, and eventual release of our flavors! Come visit us for a taste of Pier City Ciders inside the Four Brix Winery tasting room.